If you’re looking for a new, weeknight pork recipe to add to your arsenal, then this is it. We love everything about how easy and delicious this recipe is—it’s truly one-pot perfection. And an added bonus is that any leftovers make a great homemade fried rice later in the week. We love ours made with brown rice, scallions, and eggs. In a measuring cup, combine molasses and Madeira wine. Set aside. Pat pork loin completely dry. Using a small, sharp knife, cut slits in top of pork. Insert slivers of garlic. Rub entire pork loin with 1-2 tablespoons olive oil, just enough to coat. Season with salt and pepper. Place rosemary on a cutting board in a thin layer and roll pork loin in rosemary, covering all sides. In a Dutch oven, heat another 1-2 tablespoons olive oil over medium-high heat. Add pork loin and sear on all sides, until nicely browned, about 3 minutes per side. Once browned, remove from heat. Slowly pour in molasses and Madeira wine mixture and coat pork loin on all sides with it. Transfer to oven and cook for 35-55 minutes, until pork reaches an internal temperature of 145°F (cooking time depends on size of your pork loin). 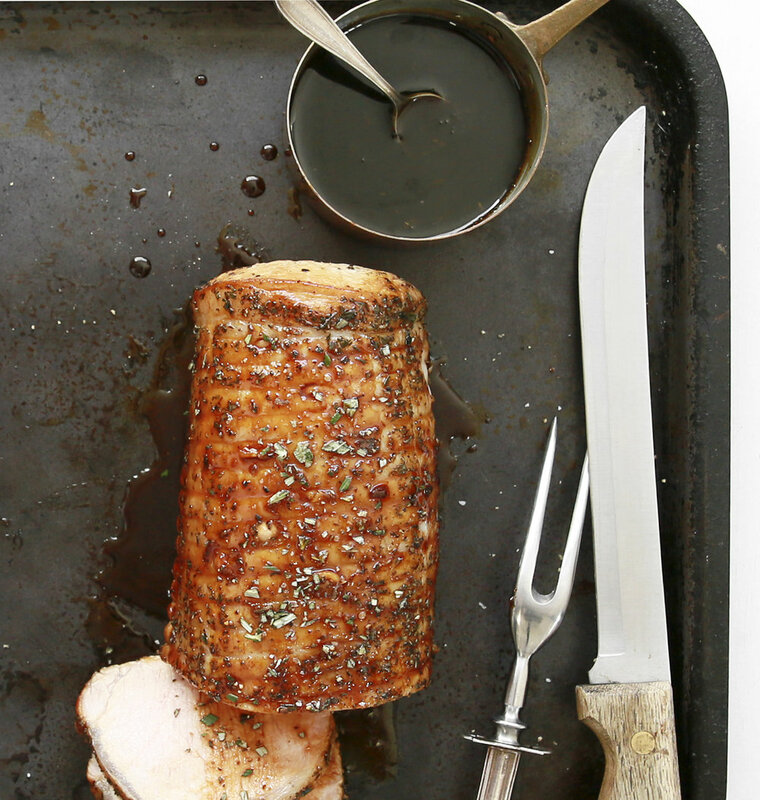 Remove pan from oven and transfer pork loin to a cutting board. Cover with aluminum foil and allow to rest for at least 10 minutes. Meanwhile, place pan with sauce over medium-high heat. Cook until sauce is thickened, about 5 minutes. Remove from heat and transfer to a serving bowl. If your pork loin comes tied, remove (and discard) string. Cut pork into slices, top with sauce, and serve. If you have a reader recipe you’d like us to consider, please email us at: info@thecoastaltable.com.